The What: Tightrope Media Systems, provider of digital signage, broadcast automation, and video server solutions, has announced a partnership with Nexistant Inc. to provide an integrated solution featuring Tightrope's Carousel Digital Signage products and Nexistant's Virtual Attendant software. The integrated solution will enable remote expert services over high-definition video, accessible via touch screen on a digital signage display. University campuses, hospitals, public transit, office buildings, and many other environments can provide true-to-life, face-to-face support with a virtual attendant for wayfinding, emergency response, general Q&A, and other services. The two companies are demonstrating the joint solution for the first time at InfoComm 2013 in Orlando, Fla., in Tightrope's booth 4859, through June 14. 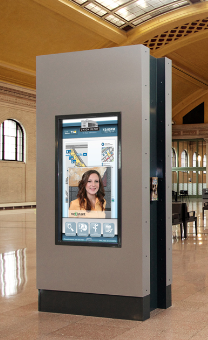 The What Else: "A virtual attendant is a complement to the interactive applications, such as wayfinding, that Tightrope already provides," said Tightrope CEO JJ Parker. "Nexistant's skills-based video routing, remote device control, and flexible software-delivery options make it a great partner for Tightrope in remote expert solutions."